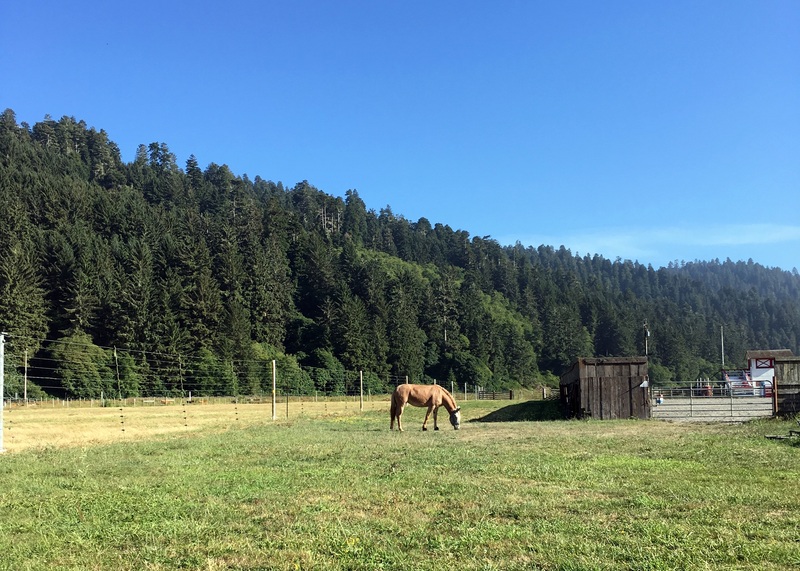 Because the Weaverville endurance ride was such a long drive and because it was a holiday weekend and we had paid time off, my husband and I left the ride on Monday morning and drove over to Orick, CA. 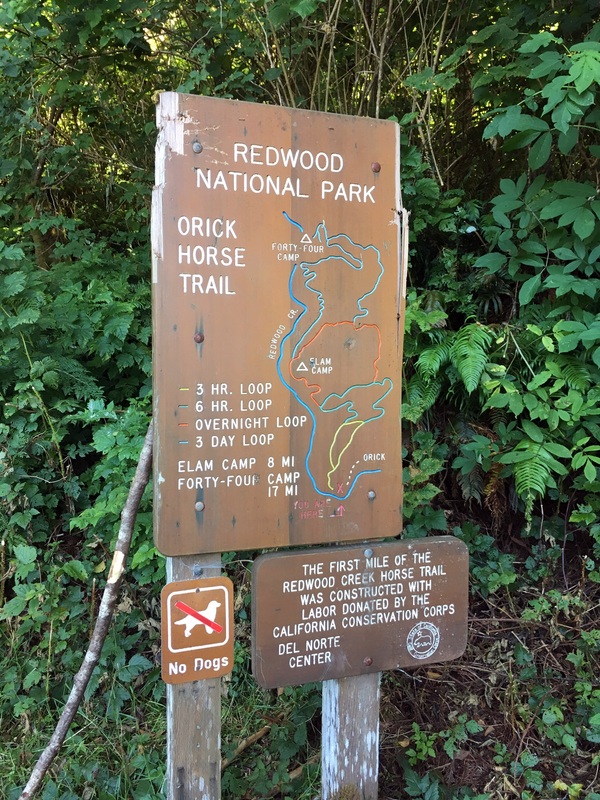 The Orick Rodeo Grounds are available for horse camping and connect to the Redwoods National Park. 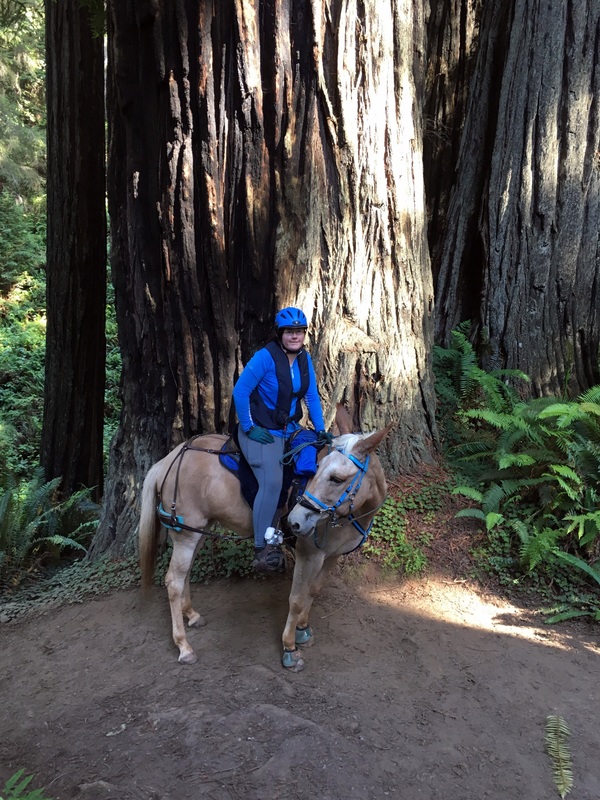 I am really obsessed with redwoods and love hiking and riding in redwood forests. My favorite park of Yosemite is the Redwoods grove. I also really enjoyed seeing the giant sequoia’s at Sequoia and Kings Canyon National Parks. I may hate living in California, but the state does have a lot of my favorite trees. 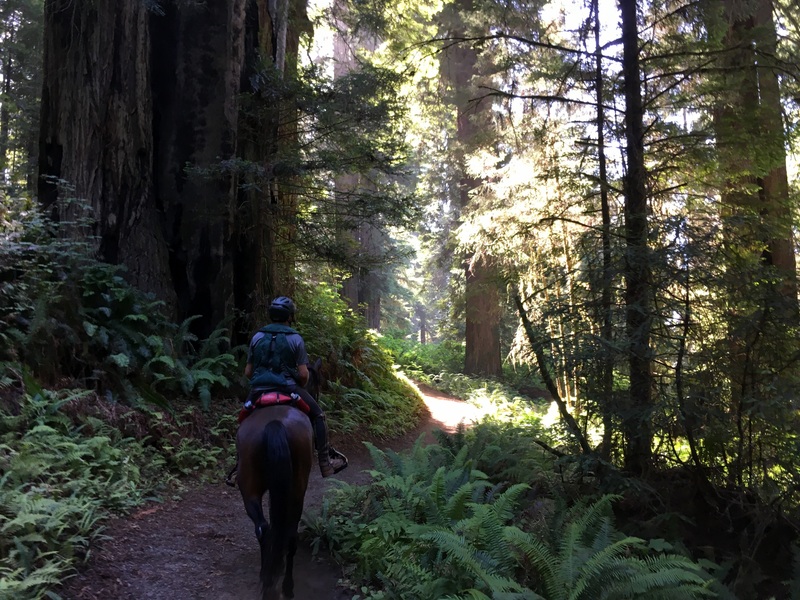 Getting up to Redwoods National Park has been on my bucket list for quite a while, but it’s 6+ hours from our house so we hadn’t managed to work it in yet. 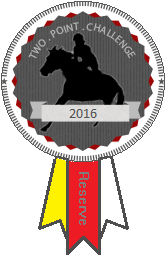 I hadn’t actually planned on taking the horses, but we were so close at Weaverville that it all worked out. Orick is a really tiny town. Like so tiny they didn’t have Diesel and only 1 functioning ATM (the other was broken). So when I called to make reservations for the rodeo grounds campground, the woman who took my “reservation” just said to bring cash and to pay it to one of the girls leading the trail rides who we’d probably see. My type A personality was freaking out about this a lot little, because I like having confirmation numbers and clear instructions, but we ventured forth anyway. And I’m so glad we did. The campground is great. We were the only ones there, so the ponies got a huge corral to share. When they weren’t in their corral, we let Nilla graze around the property with her hobbles on. Eugene got to graze with my husband holding his lead rope as we haven’t yet tried hobbles on him. And the best part? The weather was amazing. It was highs of 65 and lows of 50. In July! Coming from the heat stroke inducing oven that was Weaverville, we were so, so happy to be cool. It was glorious. I could have just stayed there and never come home. I cannot over-emphasize how amazingly gorgeous this place is. Go here. Everyone needs to go here. You can just hike or take a paid trail ride, you don’t need your own horses, but you should see this place. We only went a little ways in before turning around and coming back down. On the way back to the campground we took a side-path down to the river and let the ponies walk in the water. Or rather, we let Eugene play in the water and I kicked and shoved Nilla in. Eugene was having the time of his life. Splashing and playing and just so happy to be in the water. That night we had dinner early and then climbed into the truck because it was cold. The ponies even got blanketed. Cold in July! Ugh, I want to go back already. Anyway, we watched a movie on our iPad in between looking out the window at the fireworks we could sometimes see through the trees. When we were going to the bathroom and brushing our teeth we could gaze up at the stars and see the Milky Way. I saw this article that said 80% of Americans can no longer see the Milky Way because of light pollution. I know I can barely even see stars here in the Bay Area. If It hadn’t been so cold, I probably would have sat out in my chair and just gazed at the stars, it was so glorious. The next morning we had chocolate chip pancakes before tacking up the ponies and heading out on the trails. The trailhead has a cool sign telling you about the different trail options. 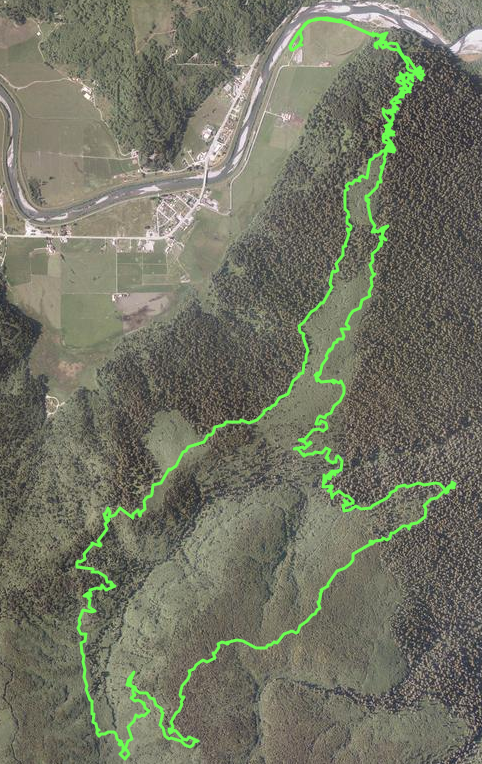 The trails are called 3 hour loop, 6 hour loop, overnight loop, and 3-day loop. The longer loops go out to back-country campsites. We had a real map in addition and decided on the 6 hour loop knowing it would be a little over 15 miles. 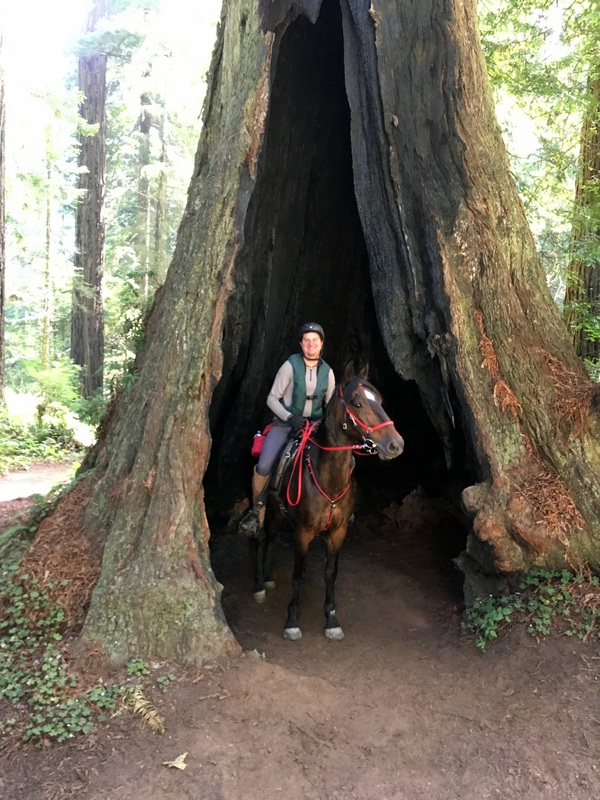 Before we even got to the first junction, we found the hollow redwood that’s big enough for a horse and rider to fit into. The local trail string even has a hitching post here so they can take pictures of all the riders in the tree. It’s amazing to me that a tree can be so big and hollow and still be alive. What was really interesting to me was how the forest would change as we went along. Some parts were filled with huge trees spread with low bushes, other parts were like rainforests overflowing with lush ferns and moss. Still other parts were filled with thin birches with sunlight flowing through the trees. The trail terrain was also pretty varied. At some points the trail was very narrow with branches closing in around us. At others it was wide and double track. Some parts were really muddy while others were nice, soft footing. At one point we were going down a very narrow switchback track going down that would zig zag back and forth every few feet. 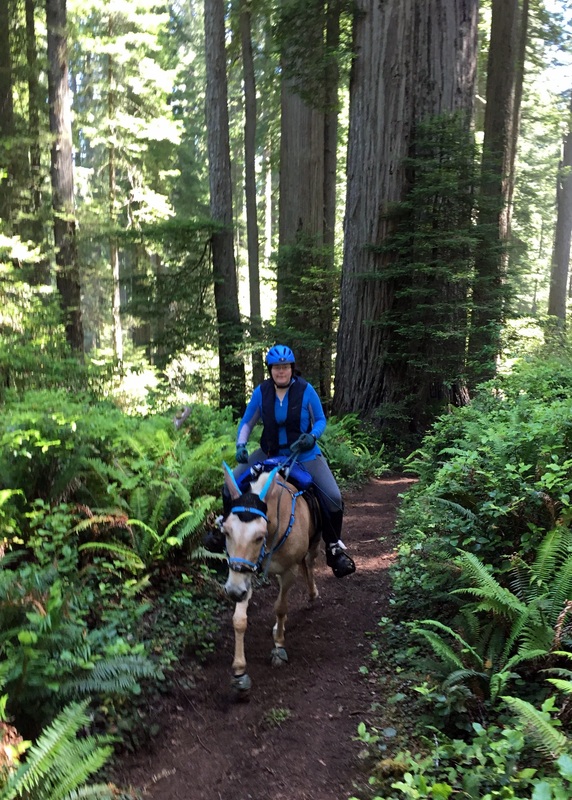 I ended up getting off and walking Nilla down the trail for that section. At the bottom of the trail, there was a bridge and water for the horses. As usual the mule didn’t want to drink anything, but she was happy to eat moss off a tree. We did almost the entire ride at the walk. Since the ponies had just done an endurance ride, I didn’t want to push them. And we weren’t in a hurry. The ride ended up being a 17.7 miles with ~2400′ elevation gain and descent and we did it in a little under 4.5 hours. This was a long ride, but it was one of the best rides we’ve done. The redwood forests are just magical. I love the big trees and the cool, foggy weather. 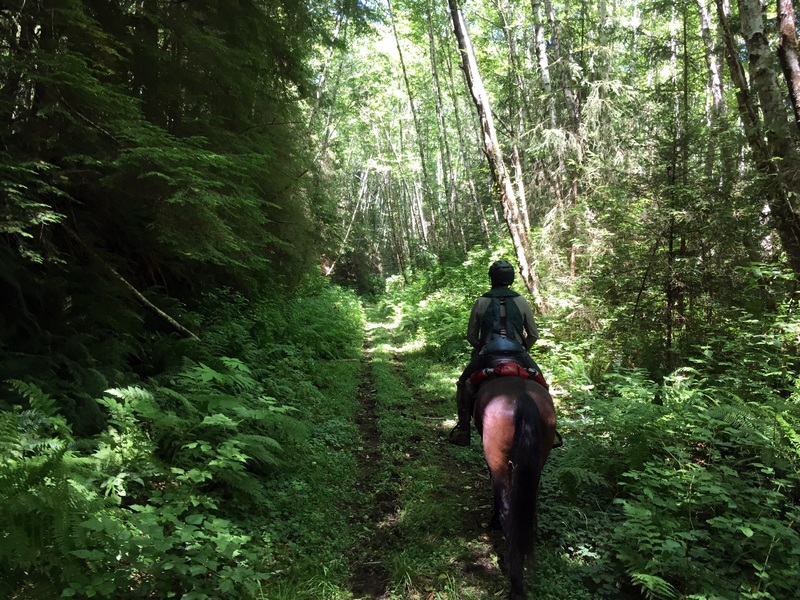 During parts of the ride I would put my reins down and my arms out to just soak in the air, to somehow absorb the forest and keep it with me. There’s an endurance ride run out of Orick on these same trails. I would love to go back for it. Unfortunately, I can’t go this year, but I hope I can get to it eventually. 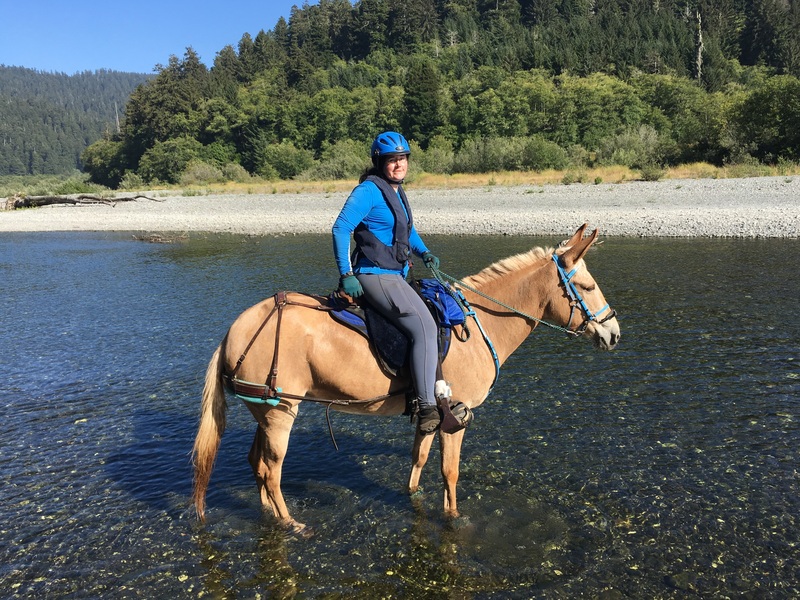 Even without an endurance ride, I highly recommend horse camping at Orick. 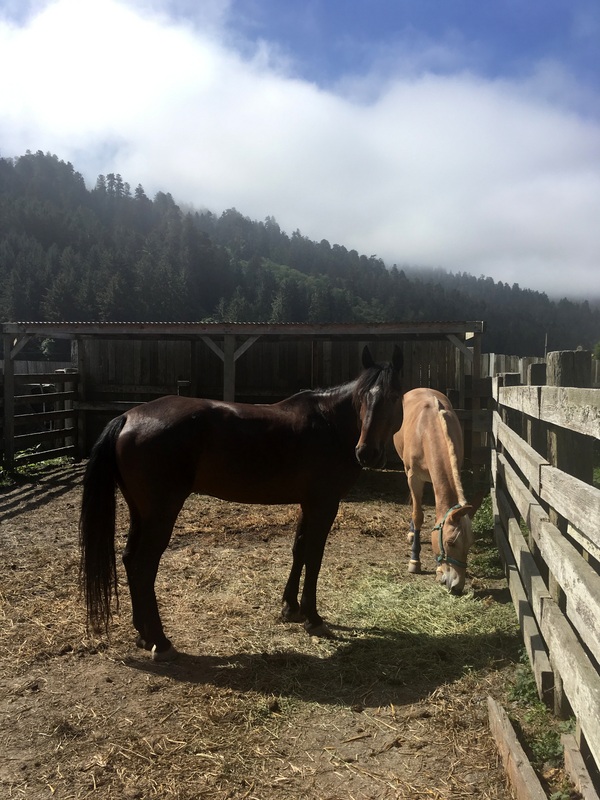 And if you can’t go horse camping, just go visit the park. There’s nothing like it in the world. Hiking in the redwoods is on my list. Now I’m adding riding. What a stunning place. And the campsite looks wonderful. It would be heavenly. 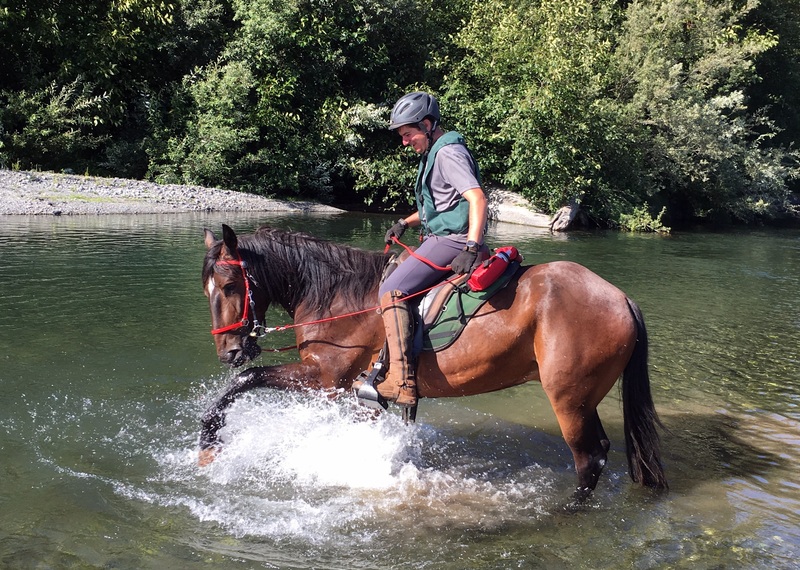 Love the photos of the horses playing in the water. Sums the two of them up perfectly. Go. Do it. Get there. It’s everything you want it to be. I hope to see the Redwoods some day. Your adventures are gorgeous. I hope you get there. There’s just nothing as amazing as this. Those trails and trees look amazing! Ooooh. Gorgeous! This just moved to the top or near-top of my ‘next unplanned vacations’ list. 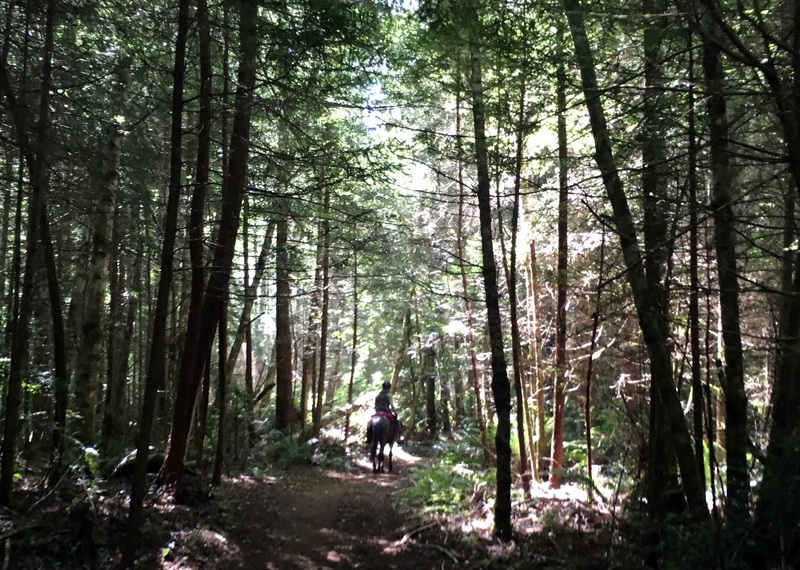 I think you’d like Cuneo Creek – super foresty, lots of shade, lovely lovely trees. That’s where I rode the (delightfully straightforward) 50 last fall. We actually stopped at Cuneo on our way back. I think we’ll probably do Cuneo this year. But I really want to do Redwoods. That is just so damn pretty. I want to go so badly, its gorgeous! That is so, so beautiful! Fantasy forest for sure. That just might make it on the road trip bucket list, especially if I could tie it in with doing a ride. Wow. Before I read this I had a low-grade urge to see the Redwoods. Now I seriously want to ride there! You must go. They are amazing.